SPRINT! 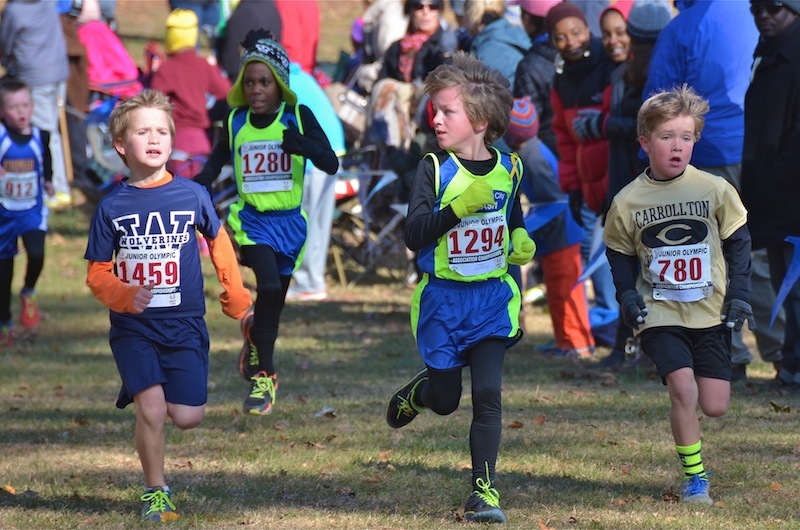 73 Boys in the 8 & Under 2000m run were marking each other and digging deep coming into the finish. 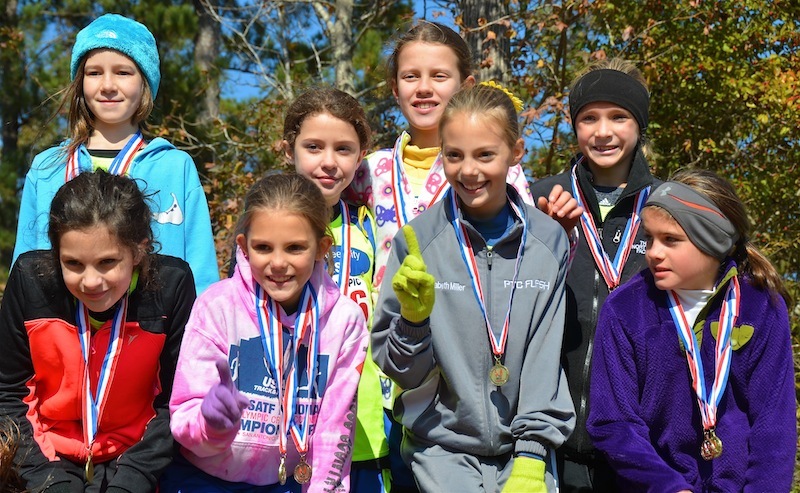 #1 - The Peachtree City Flash Girls 9-10 Team posted a score of 52 points for the win. RUSH! 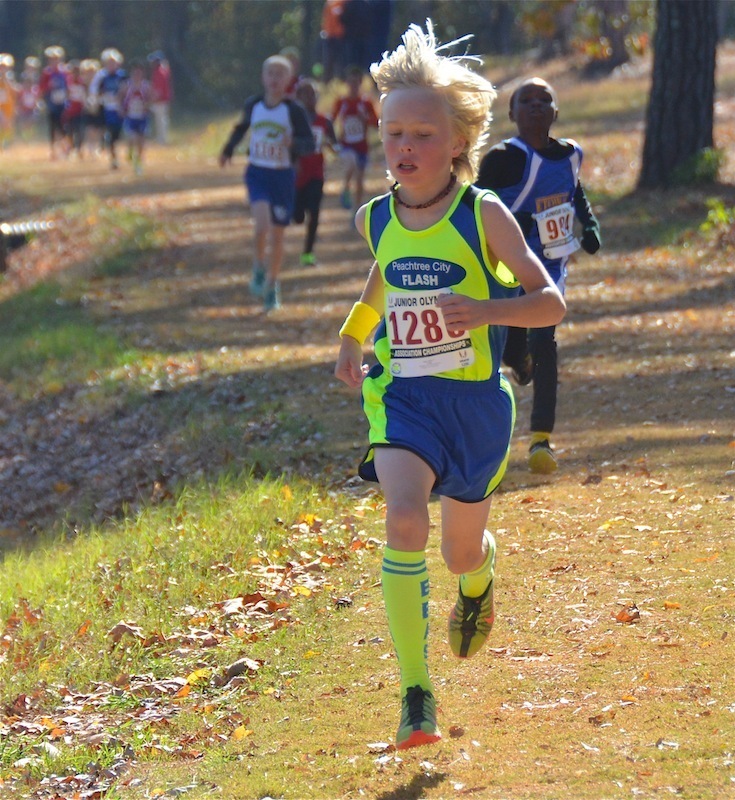 Julian Rush leads Makanga Iruku and the chasers in the Boys 9-10 3k race. Julian's 10:47.60 earned him the win. A very close Team competition for the Girls 11-12. 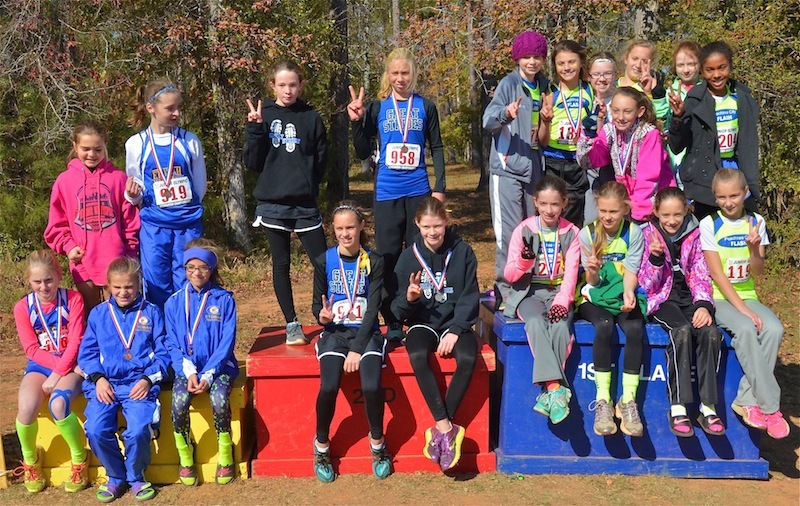 Etowah Youth Track Club - 61 points for Bronze (left). 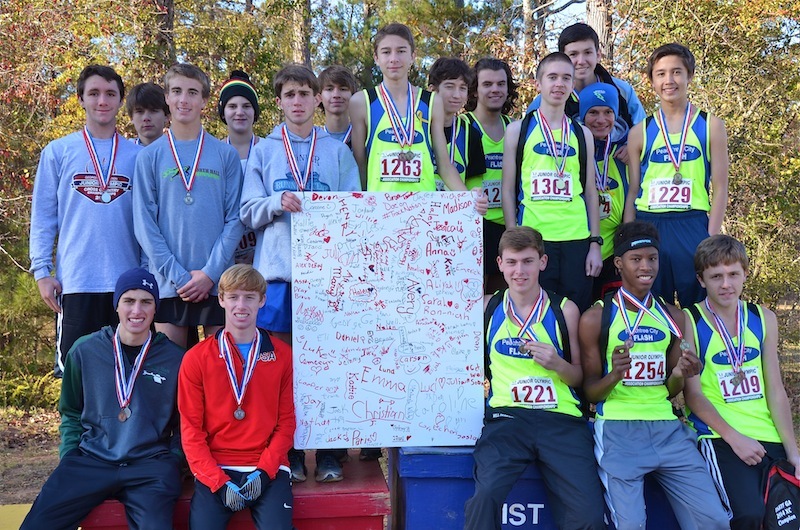 #2 Great Strides - 45 points, Silver (center). 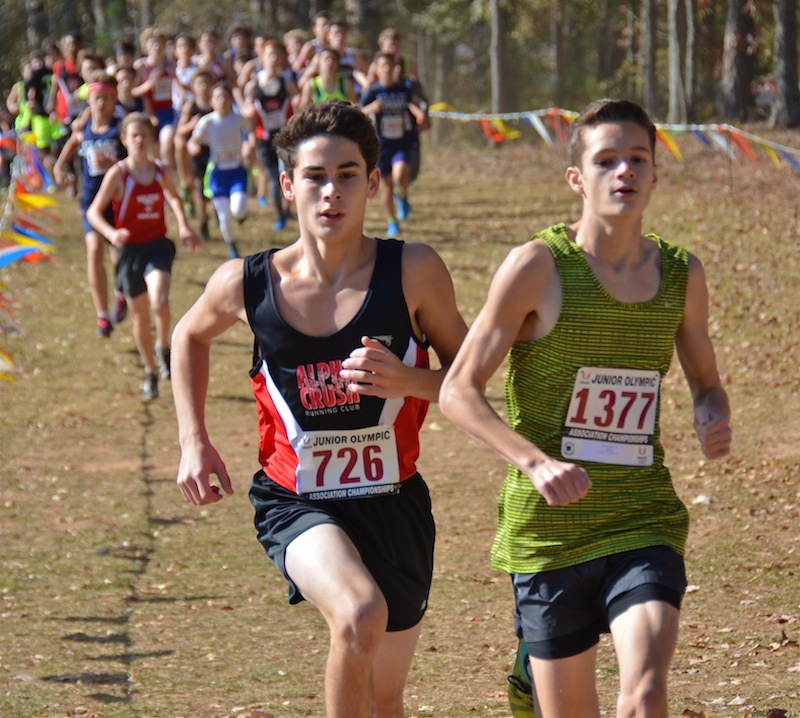 Gold to Peachtree City Flash (right) with 43 points. 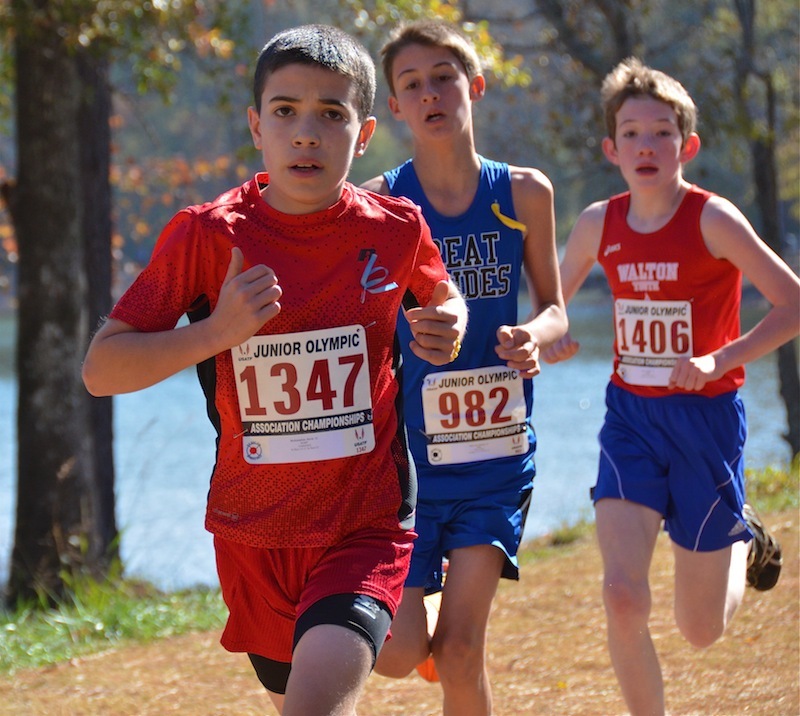 David DeChamplain leads Michael Patterson and William Brown in a terrific and strategic battle for Gold in the Boys 11-12 3k Run. The Girls 13-14 4k featured 84 enthusiastic runners. Haley Hooper worked her way to the front to win in 14:13.94. Robert Pelland, #726 of Alpha Crush, ran head to head with Jacob McLeod #1377 until McLeod fired the afterburners to take the win. 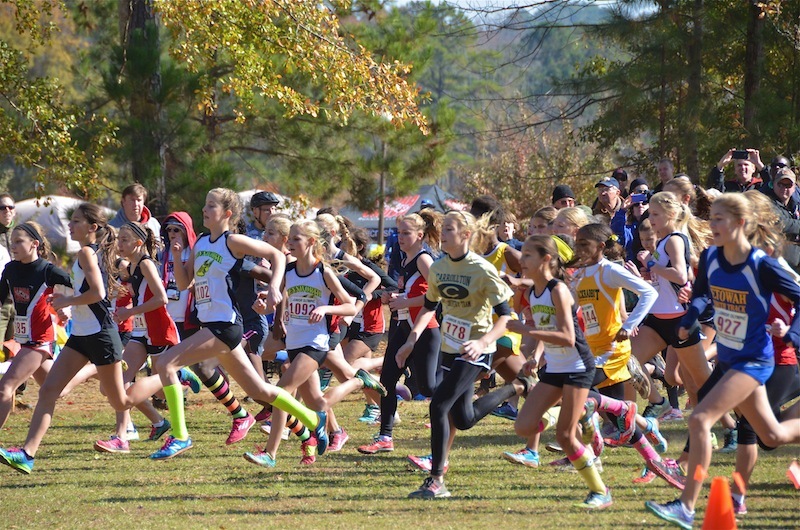 The combined Girls 15-16 and 17-18 made for an exciting start. Emma Grace Hurley (foreground, neon lime & blue) went straight to the front and never looked back. 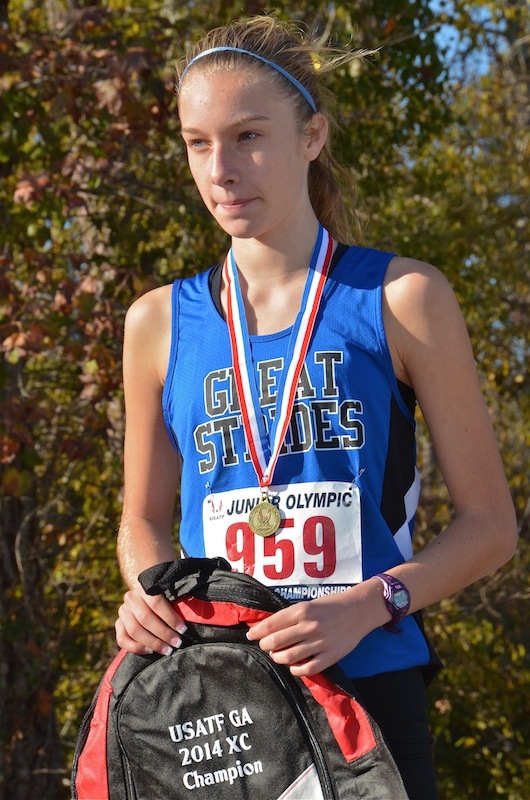 Kaylee DuPont of Great Strides delivered a terrific performance, winning the Girls 15-16 by 31 seconds with her 18:21.37. 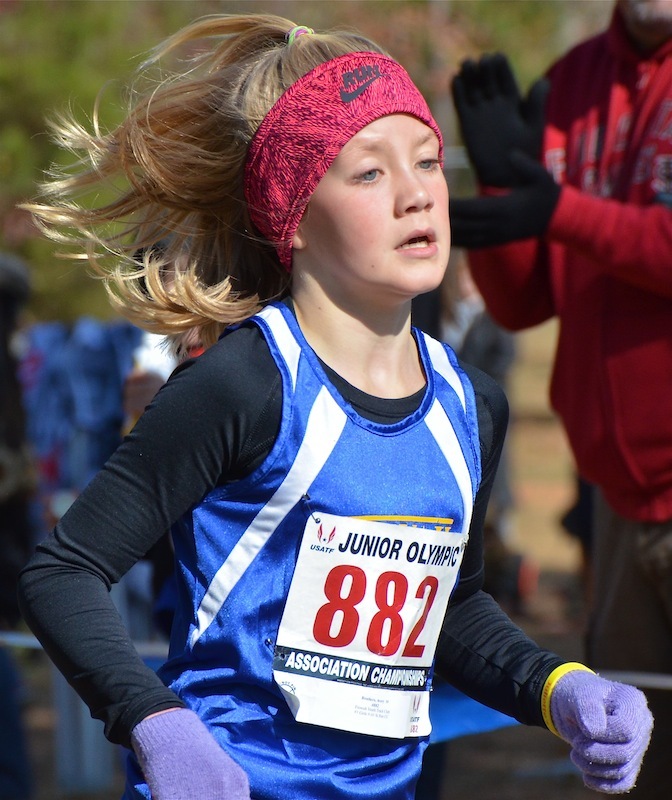 GOLD x 2 - Emma Grace Hurley won the USATF Gold in 17:55.71. 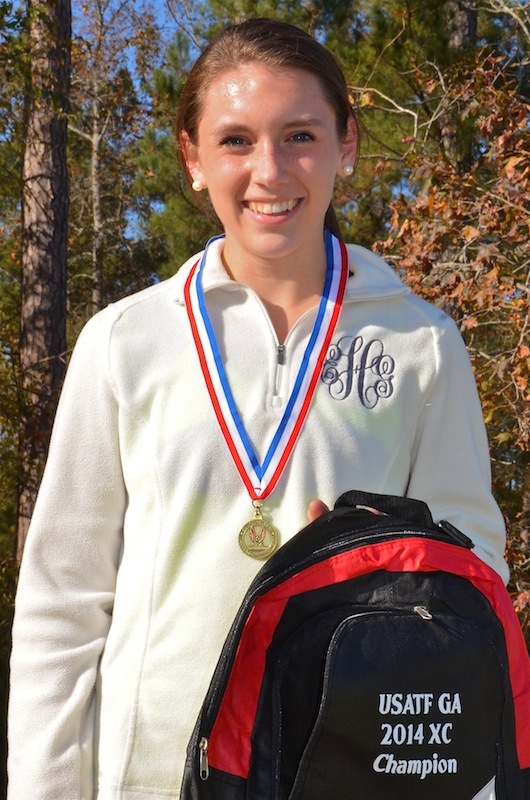 Last Saturday, Emma Grace won GHSA Gold at Carrollton in 19:06.78. 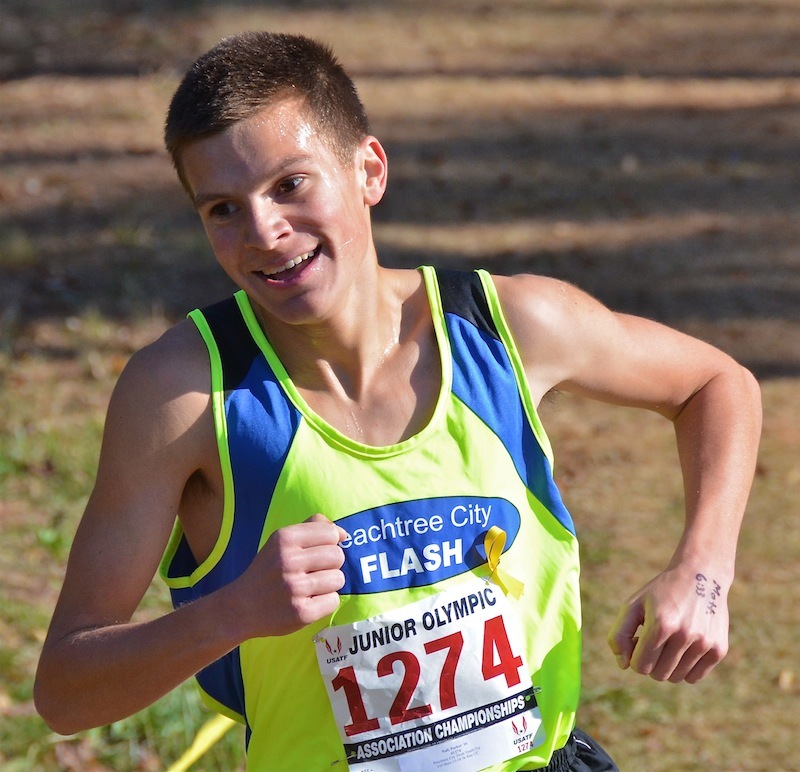 Parker Nail of PTC Flash was all smiles as he ran a smart race to win the Boys 15-16 in 16:00.69. 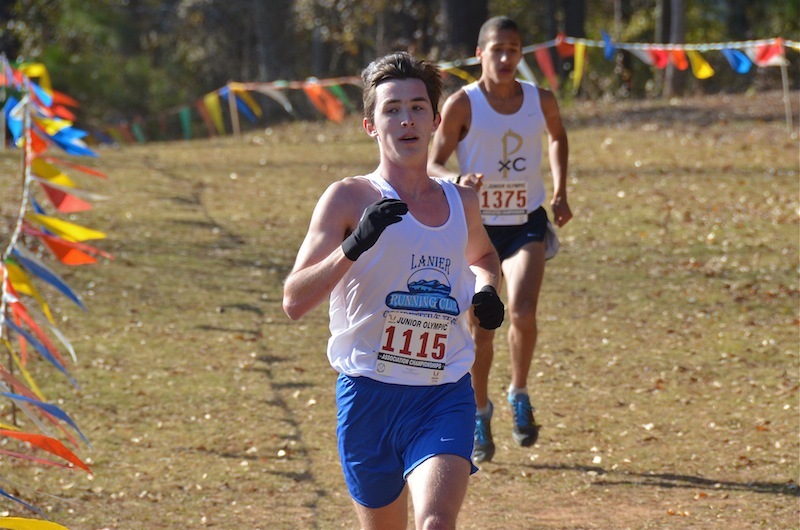 Quintin Miles of Lanier Lightning dueled with Stephen Martinez, Unattached, with Miles taking the Boys 17-18 win.